A stranger comes up and stands beside me. His expression is asking me what’s going on, and how can I address his question except to invite him forward — invite him from a safe space into an uncertain one. The uncertain space evokes scrutiny from all those outside it, a skepticism laced with curiosity. It’s that wavering skepticism’s transition into genuine interest that I find most inspiring about a rally. The transition is a mark of bravery, of a willingness to be vulnerable to two things: the scrutiny of others and information you might not want to hear. Will this bore me? Is someone about to make me feel bad? Taking that leap from passerby to participant is an incredible thing, and I saw it at the Rally to Divest IC, held by the Environmental Leadership and Actions Network last Thursday, April 18. The rally, as the stranger beside me soon found out, was being held to encourage the Ithaca College Board of Trustees to divest the college’s endowment from the fossil fuel industry. Ithaca College, like most institutions of higher education, has a pool of money that is made up of our tuition and donations which is then invested as stocks in any number of institutions. The returns on these investments are then spent by the school. 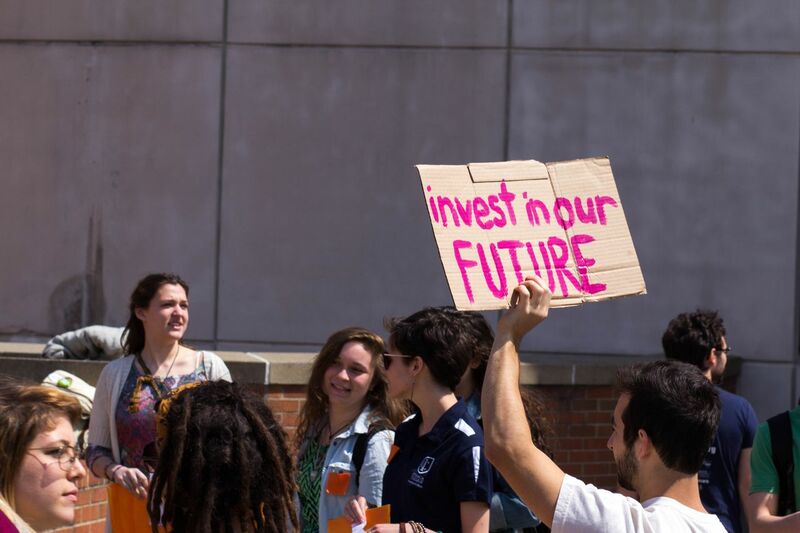 ELAN, in solidarity with college divestment campaigns all over the country, is engaged in a discourse with IC’s Board of Trustees to make their investments public and shift their money away from fossil fuels. Speakers at the rally included Devon James, a member of Spit That! Spoken Word, Alicia Swords, an associate professor of sociology at IC, Dan Apfel, the executive director of the Responsible Endowments Coalition, and Allison Currier, an active member of ELAN. The request for IC to engage in Socially Responsible Investing, or SRI, would seem uncontroversial. The Park Foundation, which funds the Roy H. Park School of Communications and the Dorothy D. and Roy H. Park Center for Business and Sustainable Enterprise, divested years ago out of an ethical pull, trying to avoid an escalating conflict with students. But for mysterious reasons the higher-ups have resisted a transparency we deserve as students and patrons of the college. The number of participants at the rally (more than 100) and the number of signatures on the petition to divest IC (more than 1000) must have made it clear to the administration on the third floor of the Peggy Ryan Williams Center that the movement’s supporters are not just a group of tree-hugging kooks clinging to their orange felt squares. They are faculty. They are community members. They are Cornellians, members of Spit That! and members of IC Feminists. On April 22, 2013, the City of Ithaca became the second city in the country to publically announce its promise to never invest in fossil fuels. It couldn’t technically divest because Ithaca hadn’t had money invested in unsustainable energy sources to begin with. Not only is it the college administration’s responsibility to respond to the concerns of its livelihood — its students — it also has at least an obligation to reflect the values of the community that supplies its name and its land. This rally was an exciting milestone on the path to a sustainable way of living, and we can’t wait to continue our negotiation with the administration on how to get the college divested from fossil fuels. Kaela Bamberger is a junior drama major with a soft spot for trees. Email her at kbamber1[at]ithaca[dot]edu.